There was a time, like two weeks ago, when I was terrified to cook a pork tenderloin. Maybe the word terrified is a bit extreme…let’s use intimidated instead. I was definitely intimidated. I don’t know about you, but I’ve been finding myself in a bit of a cooking rut lately, cooking a lot of the same things – mostly chicken and turkey. Nothing wrong with chicken and turkey, but I have been getting bored with it and I’m sure my family is too. 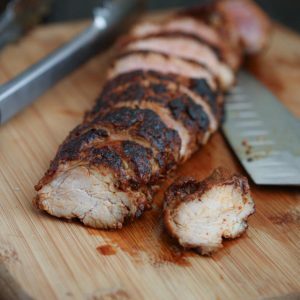 I forced myself to get out of my comfort zone and try something new – and cooked up this Roasted Chili Maple Pork Tenderloin. My family is so happy I did. I’ve made it twice in the last two weeks (experimenting with different marinades) and they devoured it. I’m so excited to have something new to throw into the dinner rotation that everyone loves (and it frequently goes on sale at the grocery store so that’s a win!). What surprised me most about cooking pork tenderloin was how quickly it actually cooks up. I start it on the stovetop, in an oven proof skillet, sear it on all sides for a few minutes then move it into a 425 degree oven for just about 10 minutes (if you don’t have a pan that can transfer into the oven then you can move the tenderloin to a roasting pan after it’s seared). I am learning the importance of using a meat thermometer, and highly recommend you use one as well. I served up the pork with brown rice and stir fried vegetables. What amazes me is how much my kids loved this entire meal. I have not always been a big meat eater (or a big meat cooker – other than on the grill), but since my kids and their appetites have grown over the years I have really had to challenge myself to cook more meals that I know will fill up bellies and that everyone will enjoy. No offense to chicken and ground turkey, but we have desperately been in need of something new for dinner. Happy to report that this mom nailed it with this one! Combine maple syrup, apple cider vinegar, oil, chili powder, smoked paprika, salt and pepper in a small bowl. Place pork tenderloin in a large plastic ziplock bag and pour marinade into bag. Gently massage tenderloin with marinade and refrigerate for at least 3 hours. Add 1 tablespoon oil in an oven proof skillet over medium high heat. Place tenderloin into skillet and sear on all sides (2-3 sides) 2-3 minutes each side until browned. Place entire skillet into oven. Cook for 8 - 10 minutes in oven. Using a meat thermometer, check temperature and cook until it reaches 145-160 degrees. Do not overcook! Let rest 5 minutes before slicing. Depending on the thickness of your tenderloins, it may take longer than 8-10 minutes to cook. Sometimes the smaller ends cook faster than the thicker middle part. It's best to use a thermometer in the thickest part of the tenderloin to gauge the temperature. Follow Aggie’s Kitchen’s board Food, Food, Food… on Pinterest. Thanks for the inspiration! We don’t eat pork but, I’m thinking this might work perfectly with “turkey tenderloins”. I will be trying this soon…..
well now you inspired me, thank you! I have to look for turkey tenderloins…we would love that as well! Hi Aggie, Don’t know if you have a “Trader Joe’s” in you’re area but, they alway have them. Also, Whole Foods–but of course, much more costly…have a good day! We just had one open up near us, I haven’t been yet. I will have to pick some up when I go. I am going to look to see if my regular grocery store carries them too! Thanks Mary Beth! We love pork tenderloins! We always grill them. I need to try your sear and bake method here – the maple and spices are a sure bet to be wonderful! This looks incredible. 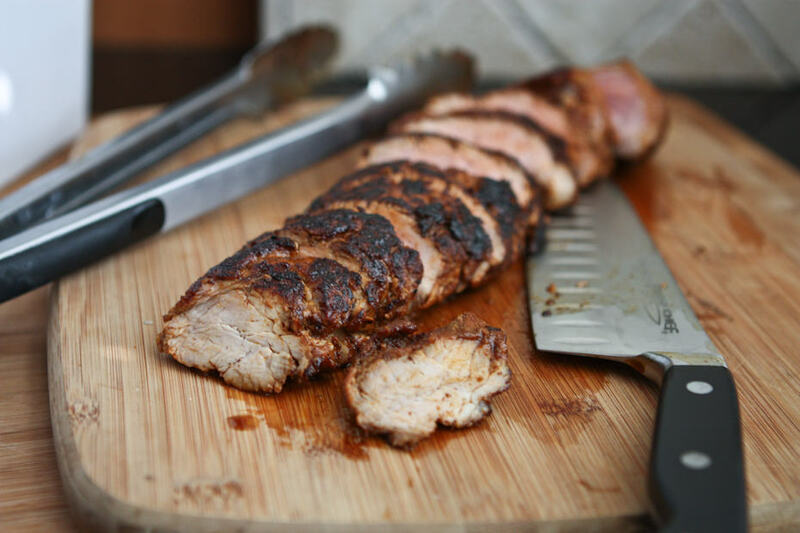 I love pork tenderloin and can’t wait to try your marinade! I LOVE those flavors! I always forget about pork tenderloin, but this makes me want to go pick one up at the store this week. Looks great, Aggie! I always forgot too…but it was on sale so I figure what the heck! So glad I did! Nice change up from chicken 🙂 Thanks Ali! I am always looking for new ways to make pork. I love these flavors you used. We had a pork roast last night (simple recipe – just studded with tons of garlic cloves and rubbed with Greek seasoning) and my kids devoured it. Just like you’re saying, I kept thinking I need to make pork more often. Love this sweet and smoky version and I know the boys would too! 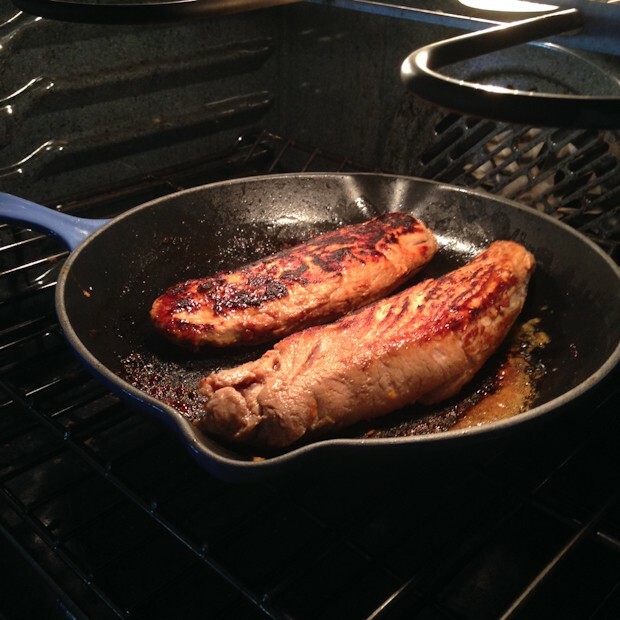 We love pork tenderloin here and it is so easy to overcook..yours looks perfectly juice! I also get in ruts sometimes and then I try and make things that everyone is NOT making…haha sometimes that works! What a great rub for the pork. We eat so much pork since it is my daughter’s favorite. 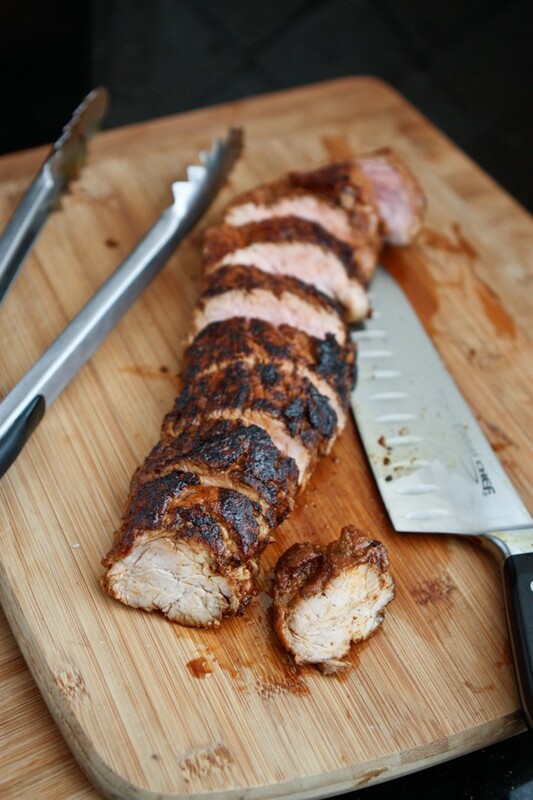 Pork tenderloin is so easy for a weeknight. Can’t wait to try this recipe. GORGEOUS! I love your marinade! I understand your apprehension about cooking pork tenderloin – I’ve had several that were so dry, they were hard to swallow. The texture of yours looks absolutely perfect! And I love the combination of spices. What a great recipe! I used to find cooking pork tenderloin a challenge too. Glad you’re out of your cooking rut. The recipe is lovely; I love the spices in it. Thanks for sharing it. 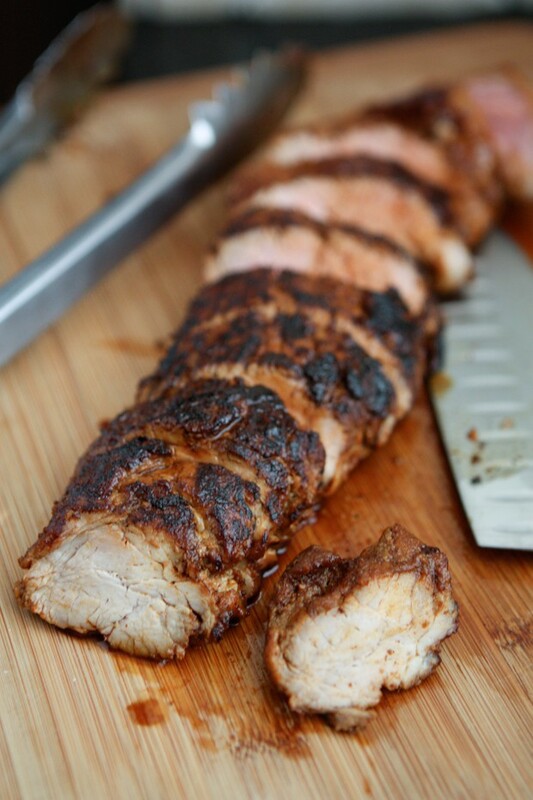 I love that you gave pork tenderloin a go to get out of the same ol’ rut! 🙂 Can’t wait to try this recipe! We have a favorite rubbed with cinnamon spices and packed with a brown sugar glaze. It’s tremendous. Btw, I’m so glad you linked to a meat thermometer because I keep forgetting to order a new one after mine bit the dust recently. Just bought from your link! ha! This took WAY longer than 8/10 minutes in the oven. More like 30 (+). Really messed my special dinner plans up. I’m really sorry to hear that Terry! I’ve made it twice, and both times the cook only took 8-10 minutes after I seared it on the stovetop. Were you using pork tenderloin or maybe a different/larger cut of pork? Sorry it didn’t work out for you!! Let me assure you that your recipe is husband proof. My wife left me a 2-lb pork tenderloin in your marinade before she left out of town. She forgot to leave me your recipe, but I remembered enough of it to sear and bake a delicious meal for the whole family. Everyone said they loved it, so thank you! Great looking, recipe. Trying it tonight! When I cook pork tenderloin in a cast iron like this, I always like to add a few sliced pears or peaches before putting it in the oven. Delicious way to enjoy the fruit, plus it leaves a beautiful pan sauce behind! that sounds fantastic! I’m going to try it with pears next time I make it. Thank you so much for the idea! Thank you!! So happy it was enjoyed! I’ll have to grab some tenderloins from Costco next time, sounds like they are a good size (and I’m sure better price!). Happy new year!! this also took me over 40 minutes to bake after searing.